Prepare yourself for the perfect spring wedding dress – this gorgeous bridal shoot from As Ever Photography showcases an exclusive new gown from Utah-based Harlow Brides. The delicate peach ball gown with floral lace and crystals made a gorgeous picture with a statement bouquet from Bushel and a Peck Floral. The fairy tale setting at the Castle Amphitheater completed the princess bride inspiration! Film photography is really the only way to do justice to the stunning ‘Sharon’ gown making its debut from Harlow Brides. Spring sunshine filtering through the layers of pastel tulle created an ethereal glow for this gorgeous bridal session that captured the enchantment of spring. To complement the romance of the dress, Beauty by Analisa created a softly waving hairstyle topped with a braided circlet. She finished the look with a rose gold smokey eye and a subtle berry lip. 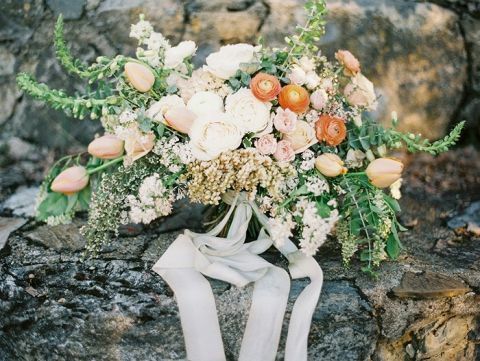 The delicate peach tones of the bride’s gown and bouquet stood out against the rough stone walls and lush green gardens of the castle setting. The shoot was just in time for spring lilacs to add a splash of purple to the sweet color palette!